The proc summons a shattering hammer. sentry kale wouldn't take box for turn in. - 105 Kitty Shammy of The Nameless... I mean Druzzil Ro.. I mean Xegony! oops.. Test.
" Where are we going? And why am I in this handbasket?" Got bracer after first attempt at quest. Was Ally to COV when I started quest, if that matters at all. Just completed the quest today. Had to do it twice (as noted by earlier posters), first time only got faction hits. I was max ally to Claws of Veeshan before doing the quests (in reference to some ancient posts that thought that might matter about whether you get the bracer on 1-2-3rd tries of the quest). Stacks of 100 are nice. Not summoned and tradable as per the description. I wanted to try this quest because I needed a quick and free way to raise throwing skill and this was easy enough. Even though the bracer is not beast useable, it is clickable from inventory (personally confirmed this) and the resulting hammers are dropable so anyone can do this quests, summon up hammers as needed and give them to whoever needs it. 100 Hammer Per Click now. and yes it is usable by berserkers now. a BST that wants to practice Throwing. anyone know if this has been updated to be zerker usable? According to Lucy this bracer is usable by Berserkers. Since there would be no direct competition, or confused reputation, any lawsuit over this would fall pretty flat. Also, there is a town of Hammerfall in Germany. Probably more towns by that name elsewhere. Hammerfall was out long before EQ, but ya I could almost do this with my Zerker for amusment heh. Everything I have read has pointed to Sentry Kale being in the room with the two Chefs. I've checked there and the surrounding area for three days and have yet to see him. Anyone know if he has been moved, the quest yanked, or if there is a different NPC that gives out the quest now? Was not giving out quest to me with indiferent faction. Said I needed to prove myself before discussing such matters. At apprehensive I was still called a talking pile of refuse. The mouths on these dragons, honestly. Do they kiss their moms with those mouths? Have been hailing this guy for weeks and all he will say is his other bad self was taken offline indefinately is someone other than Kale doing it now ? RE: Is this broken quest? Skyshrine can be a bit glitchy sometimes. Try handing him 1 copper piece first, this may "wake him up". Then try hailing him again. Are you ally to Claws of Veeshan? I know everyone likes this bracer for monks. The weight is heavy and at 65 range its not very good. SS bracer is so much better for monks got mine today range 100 weight .1 summon 60 at a time with a 100% weight reduction pouch . Why do people always use abbreviations that you can't search on? What is SS Bracer? Skyshrine Bracer, but thast is a Level 55+ quest and you need ot kill dragon in HoT,while this is like 40ish. I just got the bracer tonight. at Kindly you cant get the quest. At Warmly you will get the quest. I used the bard faction song to get to warmly, i am kindly without the song. Took me 2 trys to get the bracer. The hardest part was finding Ungdin. To clarify, he is in the mines at the back of Thugadin. take the lower passage into the mines, right away there will be passages leading left, right, and streight ahead. Take the passage straight ahead, this will curve up and around. Then you will hit a small room with passages right, left, and streight. take the passage to the right. This one looks like a dead end but dig around and you'll find an opening(i didnt have to click on a rock like Madrib did, it was just open). Its tight so if your a large race get shrunk a few times. I got in there and gave the dude 50 Plat and the note for Sentry Kale, got the velium ore shipement and headed back to Skyshrine. Woot.. Got a bracer. If you need to up your faction you can do the mercinary broch quest by killing the trolls on the way. That is good faction too. coupla more little notes: this thing is kinda heavy for a monk, so i keep it in my tink bag and swap it when i need ammo. Stats are nice tho, so, depending on other gear, they can stay on. Hammers have a range of 55, which is mediocre, but they're FREE! carry a supply of whittled fishbone darts or underbulk claws for very-long-range and intermediate-range throweps. Just did the Hammerfal quest Sunday on E'Ci server. Got the bracer first time through the quest -- probability of success *MIGHT* depend on faction standing: i am Maxxed with claws of Veeshan. The one nasty bit concerned finding the dorfie (Ungdin) in the Thurg mines. there is a little tight bit in the hallway with a click-to-move rock, and i (human monk) omitted to DUCK in there and got stuck in the ceiling. jump, FD, duck, sit, nothing worked, i was well and truly stuck. I brought a 2box druid down to port me out, and amazingly enough, right at the zone-in point to Thurg, there was my monk toon in crouch blocking the way. Invite worked there, but not port (presume out of range). Druid had to go all the way into the tunnels and then port worked. Monk ran back down, remembered to duck, clicked the rock, and bingo. I doubt that a large race could even get in there w/out a shrink potion, so be aware. ALMOST too small for a human. I can say for sure that faction has nothing to do with the chance of you getting the bracer. I have Max Claws of Veeshan myself. It took me 10 tries to get the bracer. Okay either my screen is jacked or Allakhazam really messed up. I am showing that the effect on this thing is unlimited charges of KEI. Fix this smack Allkhazam dude. If this were the truth every caster out there would be after this thing, and for a 50pp quest it would put chanters out of business and make the KEI spell seriously drop in the bazaar! To fail is human, but I'm not human so i never fail. Mrylokar Bracer - summon throwing knives. Not a quest item tho. #ewewewmememe, Posted: Jul 18 2002 at 2:09 PM, Rating: Sub-Default, (Expand Post) Hurm.. Monks can use it.. Druid can use it but rogues can't ..? Can rogues use it from the inventory? Look at the stats on the shattering hammer that you get when you use this bracer. It has 9dmg on it. The hammers are tradeable anyways (the proc summons a stack), so I doubt that was the reason ROG's were left out. NO rogues were left out because its a blunt thrown weapon.....rogues only get piercing thrown weapons....how can you land a Crit backstab with a thrown item if its a hammer??????????? Can a BL use this? 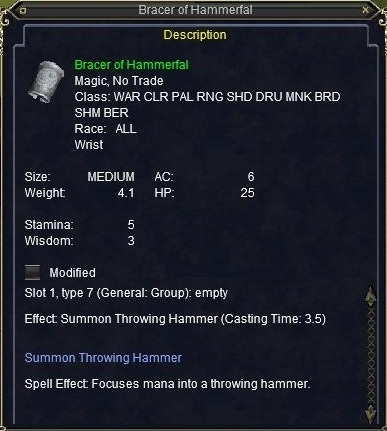 I would love to get this item for my Beastlord - can they equip this bracer and throw the hammers? Also - from what some folks have said in these posts - there are 2 diffrent versions of this quest giver? Which one do i want? How do you tell them apart? I would appricate the answers to these questions. Also - what is the minimum level you could do this quest? the plat is not an issue - but faction is. RE: Can a BL use this? The bracer is not Beastlord wearble, but you can click it from the inventory slot. The hammers can be used by Beastlord, though. There are 3 versions of Sentry Kale. One wants you to find a spy in Kael, one wants you to kill spiders in Skyshrine, and the third wants you to deliver a shipment of velium. The third is for this bracer. So you don't have to wear this for it to work, just in the inventory slot? Im sorry, I'm sure its here somewhere but I cant find it. What faction do you need? Indiff? Warm? Alley? With Coldain and Claws? Kale gave me the note and the quest at dubious (to CoV). I have not returned the stuff to him yet. I am max ally with coldain (which should not matter). Beastlords can not use the bracer as it says. but they can use the hammers. The quest took me 3 times to get the hammer. The quest starts with Sentry Kale in Skyshrine. Sentry Kale is a level 37 mob and is on 1) Claws of Veeshan and 2) Yelinak factions. Sentry Kale spawns as two different mobs, each offerring a different quest when hailed. I am not sure if the trigger phrase can be used on the spawn that offers the other quest to get the note to deliver to Ungdin. I failed to receive the hammer from the spawn that offered the quest twice. I received the hammer from the Sentry Kale that offered the other quest the one time I tried it. Kale gives you a note that you need to turn in with 50pp to Ungdin (a coldain) in Thurgadin. Ungdin will give you an Velium Shipment that is GIANT size. Return this to Sentry Kale for the reward. #NomadSpirits, Posted: Aug 11 2001 at 1:37 PM, Rating: Sub-Default, (Expand Post) Its not that your just bad at spelling, i cant even understand any of it.